*Only for current owners of a ISHA * Limited edition “Biophilia Golden Multi Hunter”. A simple Metapathia 13.000,00 euro’s (and has NOT the powers of our Metatron) and yes, they call it physiospect 23. They do NOT have Biophilia otherwise their price would be …… 15.000,00 to 18.000,00 euro’s. *They do not care about people, they only care about money ! 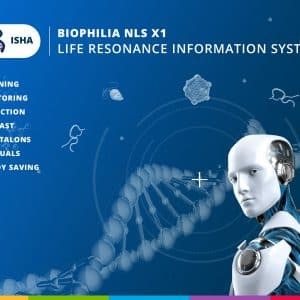 * NEW : Special SUPER Offer: ISHA BIOPHILIA X1-5000+4D SOFTWARE (ONLY FOR ISHA MULTI BIOPHILIA HUNTER) – GET 5000+ ETALONS AND100.000 REMEDIES – SAVE YOUR REMEDIES – + DONGLE > Specially for Apprentice Masters Classes : Make your 8D OR HUNTER complete ! * FREE installation worldwide ! APPOINTMENT BY THE 2 HOURS : Re-installation or Support of ALL - 3D NLS, 8D Lris, Hunter Metapathia.